In my trans-disciplinary practice I conceptually employ electronics, video, sculpture, installation, painting, photography, and craft to investigate the subtle seductiveness of power facilitated by systems of visual control. I am primarily interested in the artificial means by which we extend our ability to see and the mediating object’s affect on the transmission of images to affirm social and political hierarchies. Mise-en-Scene appropriates the language of the gallery, video games, scientific experiment, and surveillance to examine how mediation functions both to facilitate acts of violence and to uphold the assertion of boundaries between cultural and political institutions of power. In Mise-en-Scene the viewer is presented with a sealed 8-foot room. Inside the room a woman stands in darkness, surveilled by four closed circuit night vision cameras that feed her real-time infrared image to corresponding monitors imbedded in each of the room’s outer walls. Under each monitor is a large red video game button. When a viewer presses one of the buttons an electric shock is administered to one of the performer’s limbs causing her muscles to seize from the jolt until the button is released. Mise-en-Scene explores the effect of a “social relationship mediated by images” as the desire to see is transformed into a means of painful control over another’s body. The seductive quality of surveillance synthesized with gallery mores and interface transparency makes viewer, institution, and artist equal participants in the creation of the scene. In LAN Party or “National Take Your Daughter to Work Day” I graft autobiographical narrative onto appropriated images, objects, and contexts in an attempt to negotiate the complexities of power, which reverberate between the interpersonal and institutional. The resulting installation, or local area network (LAN,) implicates the viewer in an act of violence and uses the gallery as a medium to examine the historical precedence that affirms the authority of viewership. In LAN Party a Remington M700 police sniper rifle is poised atop a domestic looking table. A stool and headphone set invite the viewer to position herself behind the rifle, aimed at a small ornately framed monitor across the room. The monitor which, can only be seen and heard when standing in close proximity, shows found footage taken through the lens of an American helicopter sniper as he targets and kills Iraqis on the ground. The video is accompanied by a telephone recording of my father’s voice coolly describing the formal qualities of his own experience with the Remington M700 (weight, material, kickback.) Outfitted with headphones and enabled by the magnifying powers of the rifle’s scope, the viewer across the room receives the sniper footage in concert with the original soundtrack—the voices of gunmen and the booming sound of shots being fired. Currently my work is informed by the unique socio-political climate of the Southern California border with Mexico and the imaging technologies used to uphold it. 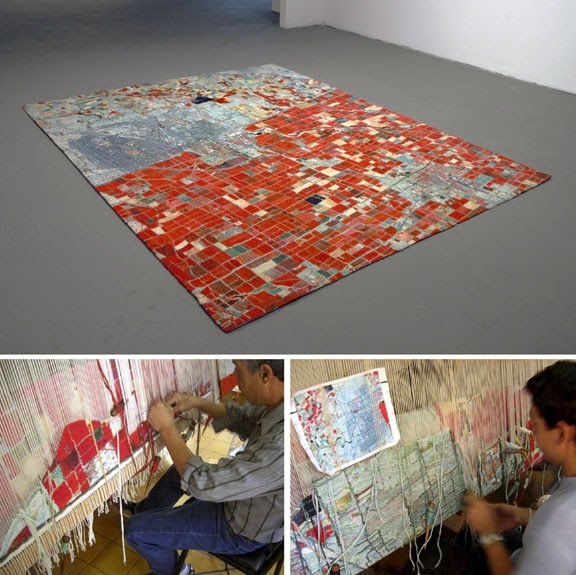 Ground Control is a wool Gobelin rug made in Guadalajara, Mexico by José Antonio Flores and Jonathan Samaniego in exchange for the amount of money it would cost a family of four to illegally immigrate to the United States. Ground Control reconstructs an image of the US/Mexico border at Mexicali/Calexico taken by the Terra satellite’s Advanced Spaceborne Thermal Emission and Reflection Radiometer (ASTER.) ASTER is made possible by collateral exertions of energy, economy, research and labor between NASA, Japan’s Ministry of Economy, Trade, and Industry (METI) and Japan’s Earth Remote Sensing Data Analysis Center (ERSDAC). Ground Control is an exercise in free monetary/commodity exchange across the U.S./Mexico border in contradistinction to the growing restrictions on human migration. The trans-national means of image collection and production of the work displaces the distinctions of national margins the ASTER photograph depicts, while the electromagnetic abstraction of the border obscures the image’s coded political content.